Showing 2 articles from May 1, 2014. The winner of the Name the Mascot Contest was Joshua Johnson, a 10-year-old from South Bend. 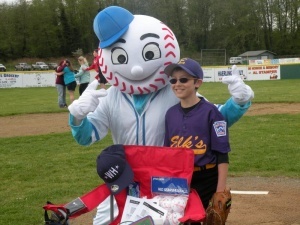 Johnson plays for the Elk's Little League Team. The winning name he picked is Grand Slam Sam. Johnson is shown at Saturday's Opening Day Ceremony at Riverdale. The winner of the Name the Mascot Contest was Joshua Johnson, a 10-year-old from South Bend. Johnson plays for the Elk's Little League Team. The winning name he picked is Grand Slam Sam. Johnson is shown at Saturday's Opening Day Ceremony at the Riverdale Ballfields. Michaela Eastham was named to the winter 2014 honor roll at Spokane Community College.